Celebrating the new year and planning many new events on your website? There are thousands of calendar plugins available for you to choose from. In this article we picked some of the best WordPress event calendars for you! We bet it would be wonderful if you have feature-rich WordPress calendar to manage that occasions. Many plugins offer a range of different features, and sometimes overlapping with one another. Display style can be problematic too, as you need to consider how it will affect the user experience. More importantly, in the mobile era, responsive design has become the norm. Here are some of the WordPress calendar plugins that cover the must-have functionality. You need WordPress calendar plugin should help manage events seamlessly. For example, a plugin that lets you, site members, or even guests list local meets, talks, and other kinds of activities.If you’re in charge of booking and ticketing, you also need to consider picking one that includes or has an add-on offering this service. Having additional event descriptions, events location maps or embedding google maps, and social sharing is also worth considering. This helps your audience connect with your events easily! Having a calendar with a good visual interface is also crucial. After all, the plugin should be engaging. The calendar should offer a range of styles, either grid, column, or list. You also might look at plugins with built-in accessibility elements, so people with disabilities can use it easily. Today, having a responsive website is a must. You need to have a responsive plugin to help maintain responsive design. We know that some table-style calendars aren’t good enough for a mobile view, so pick one that has a tile view to compensate that. Make sure that your smart-device visitors are having an easy time navigating your website. With those categories in mind, let’s find some of the best options out there. The Event Calendar is one of the most popular WordPress calendar plugins used by over 700,000 users. It has a simple user interface yet is packed with powerful features to help you better manage events. This plugin offers two plans: free and premium. Don’t worry, using the free one, gets you some of the excellent core features. You can publish events with three viewing modes, month, day, and list. It also has built-in search tools, so your audience can search for particular events in the calendar. It also helps create event reservation, check in guests, and link to google maps all while being mobile-friendly. You can use a free add-on too. Event Ticket, for example, lets you sell tickets and manage event attendee. You can’t create recurring events and display the google maps in free mode though. To do that, you have to buy the premium option that starts at $89 a year. All-in-One Event Calendar is another powerful calendar plugin available for free or with a pro license. This plugin is developed by Time.ly and is used by 100,000 users. This calendar is easy to manage with a simple interface and offers powerful features such as Timely Network, which lets you add events collaboratively with your network. Time.ly’s free plan grants essential features like filtering events and easy sharing. Free users can also create recurring events and display Google Maps, which is only available for premium users in The Event Calendar. If your website runs events for a small community organization, you might opt for their premium plan which starts at $29 a month. With a pro license, you can get additional features like Public Event Submission, EventFinder, Keyword Search, etc. Adding a ticketing add-on is a little bit steep, you need to pay an extra $59 a year. Marcus Sykes’s Events Manager is also a popular plugin, currently installed by some 100,000 users. This calendar plugin offers flexibility and many features even in the free plan. An easy interface helps you create multiple events and set them as recurring occasions. This plugin also allows creating public event submission, so your site members or guests can create events without having to be an admin. Don’t worry, you have the control to approve or deny it. Free users can also manage the venue or location, for example displaying google maps and location images, so your audience can get there pretty quickly. Events Manager also lets you manage bookings, create multiple ticket types and pricing, and add tax too. However, you need to pay for the pro license to use additional features like the discount manager and PayPal integration. The license costs $75 a year. My Calendar, is yet another powerful free option. To date, it’s installed by over 30,000 users. It also boasts excellent accessibility for helping people with disabilities access your calendar. If you think that the free features aren’t quite enough, you can opt to buy the yearly license for $49 or permanent license for $179. With the pro license, you can create an event from a post or vice versa and use the responsive mode. You can also invite guests or website members to list events for you and get email notifications when someone registers a new one. 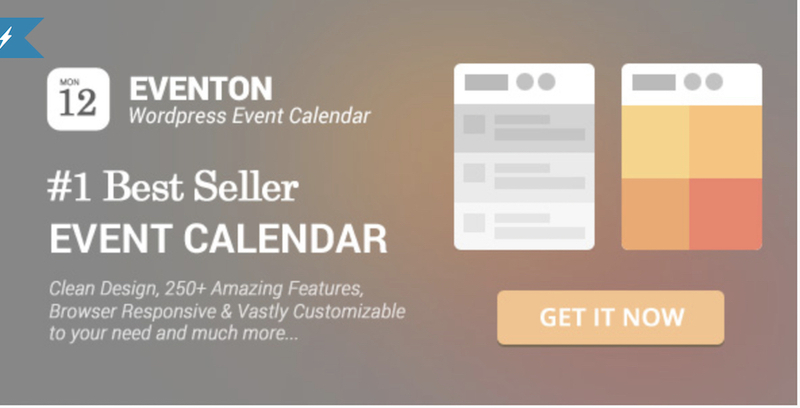 Should you fancy premium calendar from the beginning, you can use EventOn for $24. It’s the best selling calendar plugin on Envato market developed by Ashan Jay. EventOn is a beautifully crafted plugin with minimalist design and offers premium features. Over 40,000 people use this plugin. EventOn comes with a shortcode generator so you can make it mobile responsive. The appearance editor lets you customize the calendar to be the same style as your site. There are plenty of options for calendar displays. You can use a grid, list, or tile style and add images, descriptions, embed google maps, and so on. This plugin also allows you to create recurring events in any period or custom schedule pretty quickly. Creating featured events, adding the event organizer and managing event data is also easy to do. However, you don’t get the booking or ticketing features; you need to pay for additional add-ons to use those. Thanks to WordPress calendar plugin features, it has never been easier to manage events in WordPress site. That said, please take your time to test all the plugins mentioned above and look for the one that you are comfortable with. Not all people have the same needs, and you need to look at the calendar with functions that serve you well. Did we miss your favorite calendar plugins? Drop it in the comment section below so I can try it in the future.